The Bruins will be looking to rely on Tuukka Rask between the pipes, who has remained steady in net as of late, stopping 29 shots in a 3-2 overtime win against the Philadelphia Flyers. For the Senators, Craig Anderson will be making his second straight start after returning back from a hand injury. Anderson has found success against the Bruins in their last meeting and is looking to continue that streak. The Bruins Brad Marchand has been on fire recently, scoring 3 goals in his last two games while Daniel Paille also picked up a multi-point night coming off against the Detroit Red Wings. Ryan Spooner is also returning to his stomping grounds tonight and will be looking to make an impact, centering Milan Lucic and David Pastrnak while David Krejci is out. 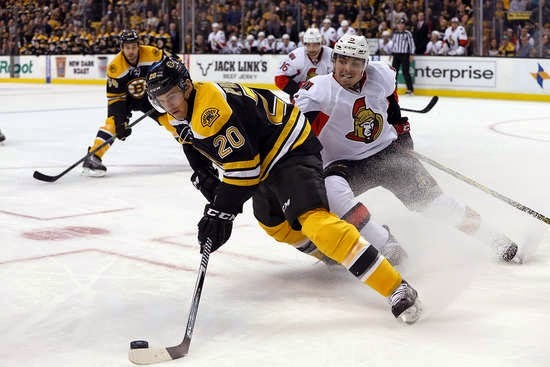 The Senators Bobby Ryan has scored the game winning goal on each of the Bruins last meetings, while Mark Stone and Mike Zibanejad have scored in their last 2 games. The Sens will be relying on their goalscoring depth to make magic happen at home. The Bruins will still be without Brett Connolly (finger), David Krejci (knee) and Kevan Miller (shoulder). The Senators will be playing this game without Clarke MacArthur(concussion), Robin Lehner (concussion), Chris Phillips (back), Zack Smith (wrist), and Chris Neil (thumb).